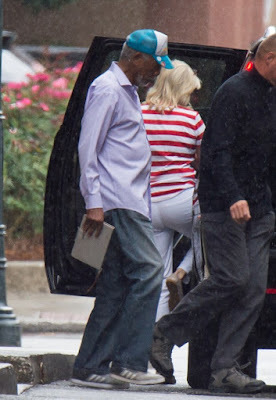 Morgan Freeman was seen heading to the set of his new film on Monday with his bodyguard and girlfriend in tow. The actor looked downcast and tried to hide his face by looking to the ground as he got into a waiting SUV, with his bodyguard leading the way and opening up the car door for the Oscar winner. 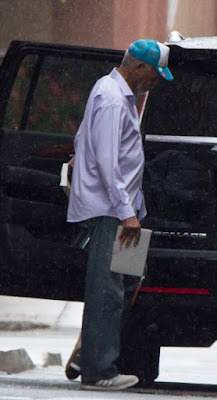 He was dressed casually in a pair of jeans and a blue button-down with a colorful hat on his head and carried tablet in his hand while his girlfriend had a book with her to read on set. It was the first time Freeman has been seen since allegations of sexual harassment were reported by CNN. Freeman is currently at work filming The Poison Rose alongside John Travolta in Savannah, Georgia. He has managed to keep a low profile since the CNN story broke last week, but did release a statement responding to the allegations. 'I admit that I am someone who feels a need to try to make women, and men, feel appreciated and at ease around me,' said Freeman.